Ellegante 3 has 531 stitches, 15 buttonholes, custom buttonhole, 3 fonts, 492 designs, 7x11.75 inch field, 120 frames, design edit. Baby Lock BLG3 Ellegante 3 Sewing And Embroidery Machine. With hundreds of built-in embroidery designs including exclusive Nancy Zieman designs, the Ellegante3 makes it easy to make every project unique. Baby Lock IQ Technology™ works with the "brain" of the Ellegante3 to help you transition between sewing and embroidery. 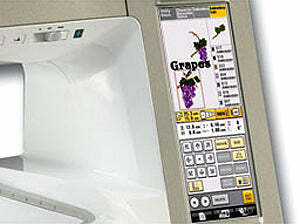 Plus, the IQ powered LCD Color Touch Screen lets you effortlessly change your machine settings. Additionally, with on-screen editing, you can put a unique spin on designs from your personal library. Baby Lock Ellegante 3 Key Features. The Ellegante 3 allows you to see more than ever before. The 3-3/16 x 8-3/8 (4,096 colors) LCD screen shows you colors, design size, multiple editing features and more. Expand your design library with the Ellegante 3’s collection of 492 built-in designs, including 32 designs from Nancy Zieman, which can’t be found anywhere else. Turn your design into exactly what you had in mind. Resize, reposition and preview designs before sewing them out. Whether you use a memory card, external floppy, flash, or CD drive, the Ellegante 3 has you covered. Also, with direct connect to a PC, you can update your machine’s software in a snap. Quickly Switch From Embroidery To Sewing. Some projects require you to both sew and embroider. 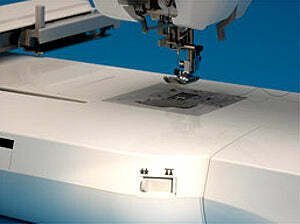 Now, with the flip of a switch, you can embroider or sew with the embroidery unit on. No need to take off the embroidery unit to restart the machine. On Request™ Automatic Needle Threading. Quickly and easily change embroidery threads with the On Request™ Automatic Needle Threading System. Simply push a button and the Ellegante3 does the rest, threading the needle in only 4 seconds. Switching out threads is so convenient you’ll never have to limit the number of colors in your designs. 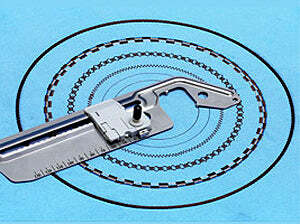 Stitch in a perfect circle with this easy-to-use attachment. 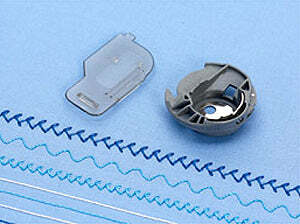 The Circular Sewing Attachment can be used with any forward-feeding utility or decorative stitch. Use the braiding and cording feet to add more dimension to your projects. Use the Baby Lock bobbin work case to make the bobbin work capabilities of your machine simple and fun. Explore a variety of decorative and utility stitches from an entirely new angle, to create fascinating textured projects. Baby Lock Ellegante 3 Specifications. LCD ergonomic color Touch Screen 3-3/16 inches x 8-3/8 inches (4,096 colors) with touch pen. USB (Type A) allows connectivity with a mouse and hub. 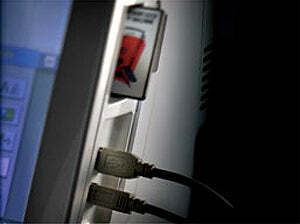 USB (Type A) works with external drives, flash drives and CD-ROM drives. USB direct connect (Type B) to a PC. On screen hoop sensor to recommend size of hoop. Access designs stored in folders when using USB Type A. The Ellegante 3 will stay current with future upgrades via USB connection. Warranty (25-years limited, 10-years parts, 5-years computer circuit, 5-years electrical, 1-year labor). 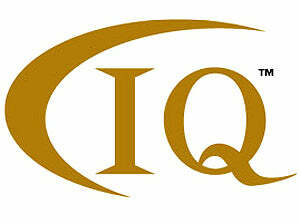 Optional Gold Standard Comprehensive Care Program. 6-1/4 inches x 10-1/4 inches (160mm x 260mm). Continuous Border Hoop (100mm x 180mm). Baby Lock Ellegante 3 Embroidery Specifications. 1°,10°, and 90° pattern rotation. Design selection and placement using drag and drop capabilities. Measurements displayed in inches or millimeters, Color separation, Thread color indicator. On screen hoop size indicator. Changeable background colors of embroidery patterns. Changeable background colors of design thumbnails. 412 Baby Lock exclusives including 32 Nancy Zieman designs. 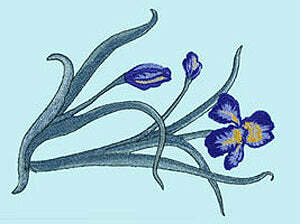 150 Decorative Stitches can be embroidered. includes 74 exclusive script alphabet characters. Embroiders up to 7 inches x 11 3/4 inches (180mm x 300mm) embroidery field. 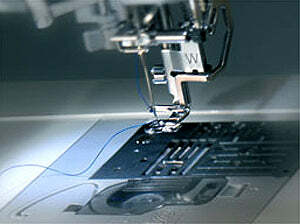 Reads embroidery designs with a stitch capacity of up to 350,000 stitches per design. 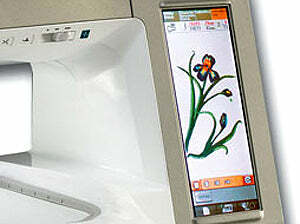 Embroidery speed up to 1,000 spm. Program thread cutter ON or OFF. Baby Lock Ellegante 3 Sewing Specifications. 118 Utility including 15 one-step buttonhole styles and one 4-step custom buttonhole. 17 Cross, 63 Combinable Utility stitches. Edit and combine Character/ Decorative stitches. 20 Memory Pockets for Character/Decorative stitches equaling 256KB. 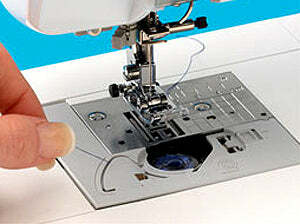 Sew Utility and Decorative stitches while embroidery unit is attached. Large sewing surface 14-3/8 inches x 8-3/16 inches. Baby Lock Ellegante 3 Included Accessories. Specialty bobbin case and cover for bobbin work. Carrying case for embroidery unit. 7 inches x 11-3/4 inches (180mm x 300mm). 5 inches x 7 inches (130mm x 180mm). 1 inches x 2-1/2 inches (20mm x 60mm). Cording (with 3 cord guides). Baby Lock Ellegante 3 Information.